It's never too early to begin indoctrinating your children into the works of Shakespeare, apparently. 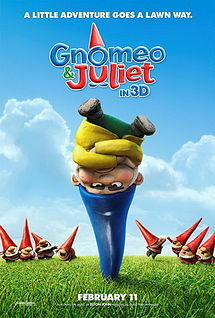 This movie is nothing new, as we've all seen the Romeo and Juliet story a thousand times in various forms. But have you ever seen them as gnomes? No? Well then you are in luck. There's really nothing more to say about this movie. Sorry. Final word: Like most every other non-Disney children's movie, it's not bad to sit through once, but hope your kids don't latch onto it as a favorite.